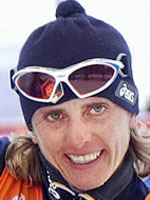 Italian cross-country veteran Stefania Belmondo overcame a pole-breaking fright to edge Russian rival Larissa Lazutina in a dramatic sprint finish and win the opening event of the 2002 Winter Olympics at Salt Lake City. Belmondo, then 33, collected her ninth Olympic medal after upsetting the formbook to win the women's 15km freestyle mass start race, and then followed it up with a silver in the 30km classical. "Today I'm very, very happy. It's simply incredible," said Belmondo after her 15km freestyle victory. "I broke my pole at the 10.5km mark and lost around five or six seconds. A French guy ran up and handed me a pole, but it was too short". "Eventually my coach got a pole to me and when I caught up with the group I knew I could catch up," added the Italian who was close to tears. Belmondo had recently taken her 30km gold medal, won in 1992, along to a television function in the Italian Alps. Because of the extreme temperatures, it somehow broke into pieces. "So that's when I said to myself that it's time to get another gold," she beamed at the post-race press conference. She added the title to her previous one gold, two silvers and four bronzes in Olympic competition. Belmondo was instrumental in ending a barren Olympic spell for Italian cross-country skiers with her performance at Albertville in 1992. For long periods in the shadow of her more successful compatriot Manuela Di Centa, Belmondo was not to be outdone in France, where she won Italy's first gold medal since Franco Nones (in the 30km classical) at Grenoble in 1968. Her list of honours also includes five world championship titles and 13 medals overall in a six-year period between 1993 and 1999. Strangely enough, she never won the World Cup overall title, finishing second on four occasions. Russian legend Yelena Valbe got between her and the title no less than three times, with Norway's Bente Martinsen beating her on the other occasion. Her 24 World Cup victories make her the circuit's second most successful athlete, once again trailing Valbe in overall victories. After her success at Salt Lake, she retired at the age of 33 and in September 2003, had her first child, Mathias.